Voted best of Western New York, no other local cross country ski area compares to Byrncliff's 12 miles of finely groomed, lighted and scenic trails. We welcome winter sports enthusiasts of all levels - experts and beginners alike. We offer a full line of ski and snowshoe rental equipment in our ski shop for adults and little adventurers. 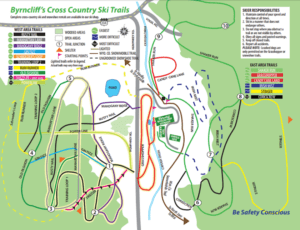 Click here and print the trail map at your convenience!